It is interesting to reflect on the activities that must have been occurring in Thames Ditton ninety years ago in the first week of April in 1909. You see, April 9th is when the Empress of Britain will next sail from Liverpool for Canada. And this ship will carry several thousand persons destined to become Canadian settlers, many of them pioneers on the prairies which are just opening up. On this ship -- the tickets have been arranged -- will be sailing Polly Elizabeth [nee Strange] Melbourne, together with her two children Leonard Edward and Elsie Maud. Also traveling with them will be Leonard's friend, from the school they were both at, Frank Scott. The voyage has been planned for some time. As it happened, Edward Melbourne, Polly's husband, had been in Edmonton the summer of the previous year.While there he had encountered a lineup of people, on the main street of Edmonton (at that time Edmonton was a major center of western Canadian commerce with a population of about 5,000!). As the story has been passed down, Edward inquired of an Indian at the back of the line what was going on. Well, it turned out that land was being given away. Imagine, giving away land! Edward decided to join the line and sign up for his 'estate'. This done he wrote back to his wife and told her to pack up and come out -- he had 160 acres, an unimaginably large estate for someone from England. Now you might wonder how it was that Edward was in Edmonton. The story, as I have it, is that he came into some money about 1907 and decided to see some of the world, or seek his fortune, or whatever. He had been an avid outdoorsman in his life, a game keeper on an estate and was generally interested in shooting. His first destination was the United States, probably in search of 'the wild west' or some of the hunting opportunities or whatever. The story goes that while in the U.S. he was somehow or other separated from his money, however much he had with him, and had made his way to Canada, ending up eventually in Edmonton. It is worth noting, that by this time, 90 years ago, Edward was no longer a young man. He was born in 1860 so he was 48 years old when he joined that line up in Edmonton. Imagine the change in lifestyle that this meant for the family as they packed to go from the civilization of London, England (Thames Ditton is on the south bank of the Thames just a few miles west of the center of London -- and in those days London was the center of the British Empire, arguably the greatest power in the world). They would be moving to a land that was known as a wilderness -- they would know this through the articles in newspapers and through books -- but they would not have the large pictorial coverage (although there would be some -- mostly engravings, not photographs) and certainly little if any video type information -- movies were just starting in this decade. The move meant a dramatic change in life style -- but also a permanent one as there was no expectation of ever returning to England. Polly was seven years Edward's junior and forty two years of age as she packed for this trip to her new estate in Canada. Polly's son Leonard was by now 18 years old -- almost 19 and her daughter, Elsie, was 15. Elsie used to describe vividly how they carefully packed all the things that they would need on the estate, the china, silver and linens and one can imagine that the last week in England was busy with this packing. They also packed such other necessary items for estate living as Edward's golf clubs. Leonard's book "52 Stories of Greater England" which contained stories of the wild frontiers of the colonies ('Greater Britain' as they were referred to in those days). a china plate which was a wedding present received by Edward and Polly. a pair of decanters, one of which did not have the correct stopper -- it was left with one of Polly's sisters. a handkerchief that belonged to Charles Dickens. a photo album which contains photos of members of the Melbourne and Strange families. There were family and friends to visit and say goodbye to -- they did not know if they would ever come back to England. Polly took leave of her mother Elizabeth (her father Charles had passed away many years earlier in 1890) and her two younger sisters, Louie (Sarah Louisa) and Annie. (Louie and her family would keep in touch with Polly and her family over the years and her son, Jack Davies and his wife Lou, would eventually visit them in Waskatenau, but that was not to be known yet). There were also goodbyes to be made on the Melbourne side of the family and Elsie would talk in later years of some of these aunts and uncles (Edward was one of about 14 children! ); I particularly remember her talking of her Uncle Martyr. 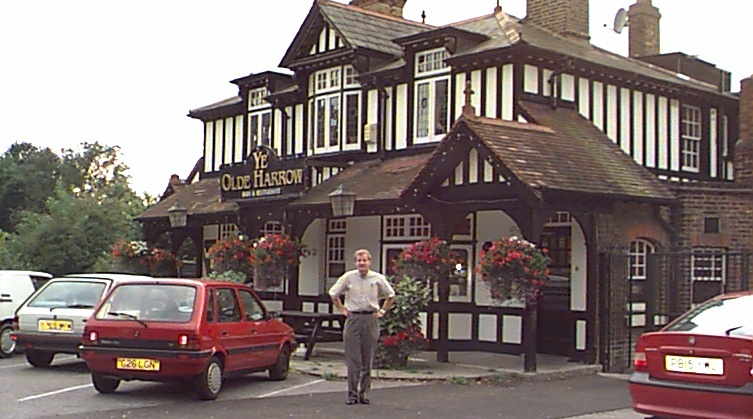 In addition to the packing, there was also the business of turning over "Ye Olde Harrow", the pub that the family had been managing, to others to manage. 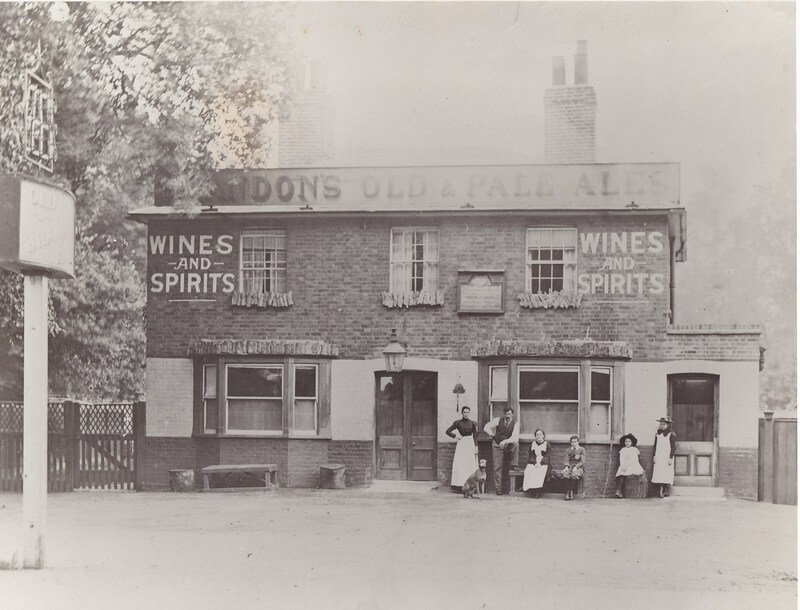 Photograph of Ye Olde Harrow taken about 1898. Clearly visible from left to right are Polly Elizabeth (Strange) Melbourne, Edward Melbourne, unknown, Leonard Melbourne, Elsie Melbourne and unknown. From the late 1890's until 1908-9 Ye Olde Harrow was managed by Edward Melbourne and his wife Polly. It is quite possible that they moved to take over Ye Olde Harrow after leaving Northgate Estate. I have also heard the rumour that Ye Olde Harrow was owned by Mr. Clapper, the owner of Northgate (or that he arranged the position for them). One of the curios given by Polly [Strange] Melbourne to Phyllis [Morgan] Scott, wife of her grandson Leslie, was a handkerchief, supposedly left at Ye Olde Harrow by the author, Charles Dickens. The handkerchief was embroidered with Dickens' initials. This treasured heirloom was in the possession of Leslie Scott, but its location is no longer known. The handkerchief apparently given to Polly by a maid at the pub who had kept the handkerchief for many years (Dickens had died in 1870 and the Melbourne's did not take over the pub before the mid 1890's. What of young Frank Scott, who was 19 and who was travelling with them? Leonard and Frank had been a students at Tiffinians School in Kingston on Thames as recently as 1908. During the period from Christmas 1903 until July 1908, Frank had been at the Tolworth Council School school as a probationer and pupil teacher (It was here that he was placed under the personal direction of John W. Barnett who would also go to Alberta). He was recommended and became an Assistant master (preliminary certificate) at the council school in Walton on Thames, from Sept 1908 until March 31st 1909. He was also a 'student under the Surrey Council Scheme' at Tiffinians (also known as Tiffins) until mid 1908. One of Frank's last activities in this week was to obtain a letter of reference from his latest position -- a letter signed by Thos. Knapman, head master, on 7 April 1909. He would take this and his other letters of reference with him to Canada as he might want to pursue a teaching career there. Why did Frank leave England at this time when he was well on his way to becoming a certified teacher, as his older brother Sydney would? One of the statements that was made was that there was no money available for the formal training that he would need -- that the money available would be consumed by Sydney's education. However, Frank's grandfather William Scott had died just a couple of years earlier and had left some money for Sydney and Frank to be educated. According to Frank's niece Iris, this money was in the bank pending Frank's need for it in his education. Iris also tells of how during these last few weeks before the trip, Polly made a visit to Frank's parents (who by now were living in Portsmouth, so it necessitated a visit by train) to ask that this money be released to Frank for his use in Canada. However, Walter, Frank's father, insisted that the money was for Frank's education and it would be there when he returned to England to resume his career as a teacher. So it would appear that Frank left for Canada for other reasons, perhaps as an adventure. Thus, probably with relations strained between him and his parents, Frank would have taken leave of them and of his siblings, Sydney who lived nearby, Lillian who was in Brighton where she lived with her husband Bert Fry and Kitty, the youngest of the four at 14 and who lived with her parents in Portsmouth. It would have been an emotional and busy week as they prepared for their new life in Canada, ninety years ago this week.